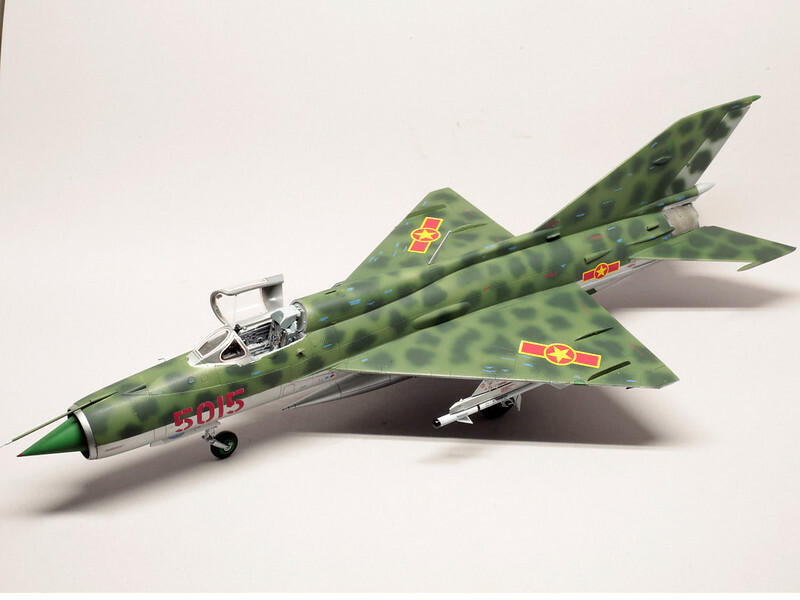 Very nice work on that Mirage, I like the camo. 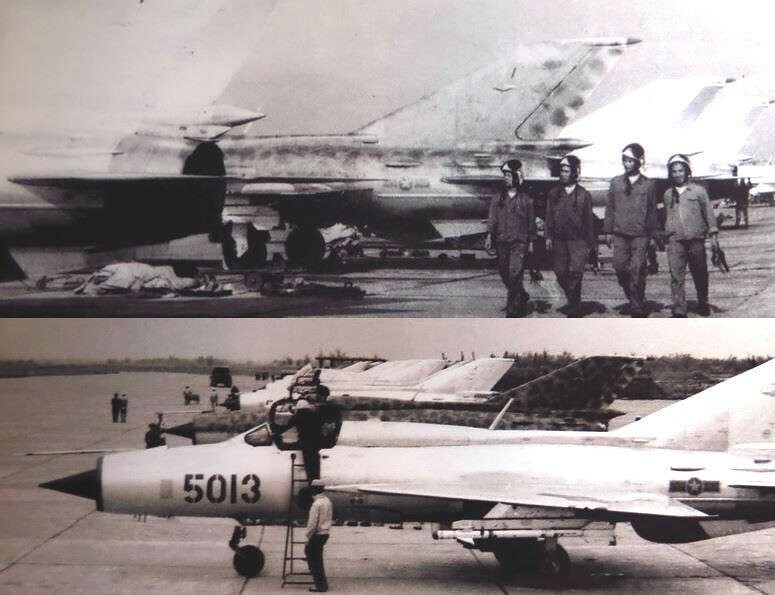 Too bad about the Foxbat. 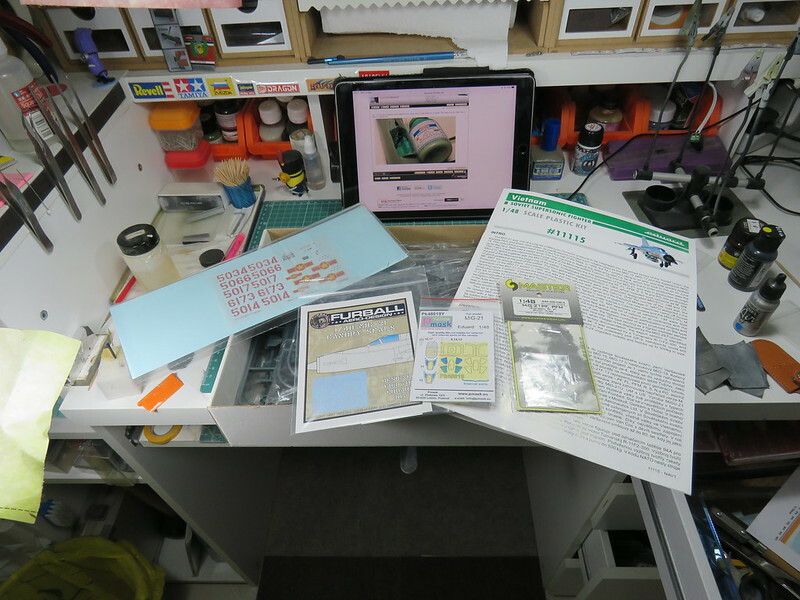 You will do a great job with that Eduard kit. I like the Finnish camo. 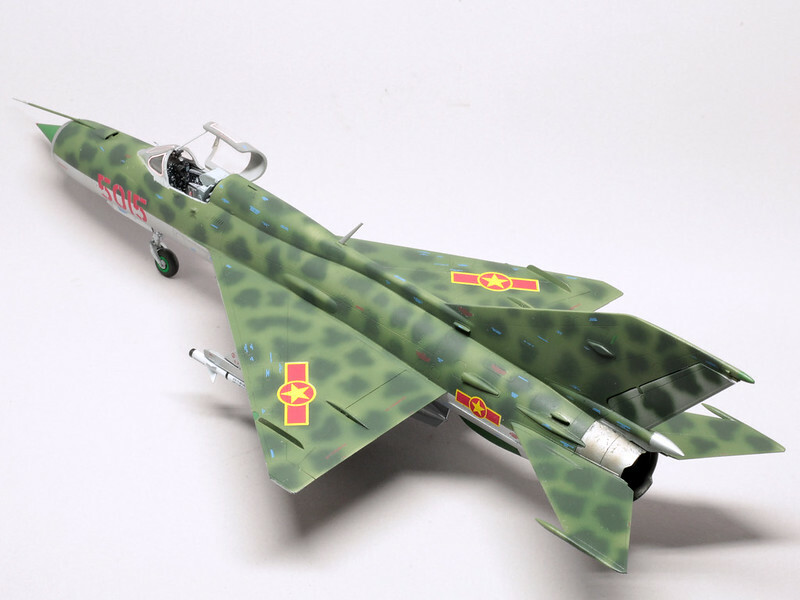 That Mig-23 is a very poor kit. Good work on the AMK. 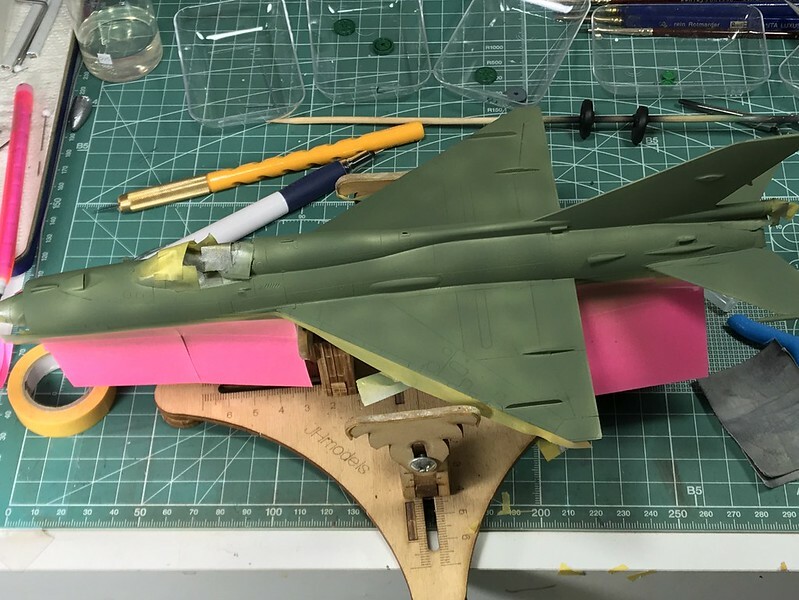 Great to see all these cool kits getting build !!! Sorry to hear about your back, hope you're better soon! 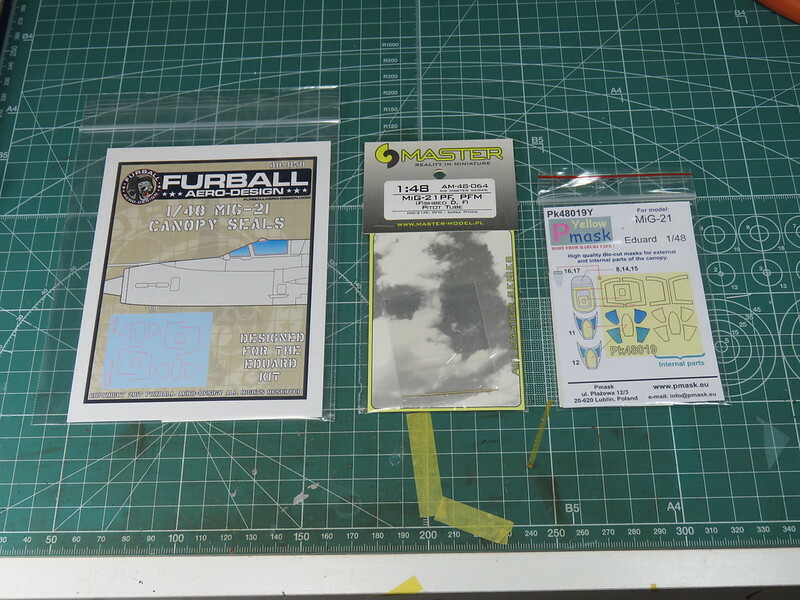 I'm only two months behind schedule for posting these pics, but that's okay I'll be building Airfix's 1/72 AV-8A Harrier, my first Airfix kit actually. 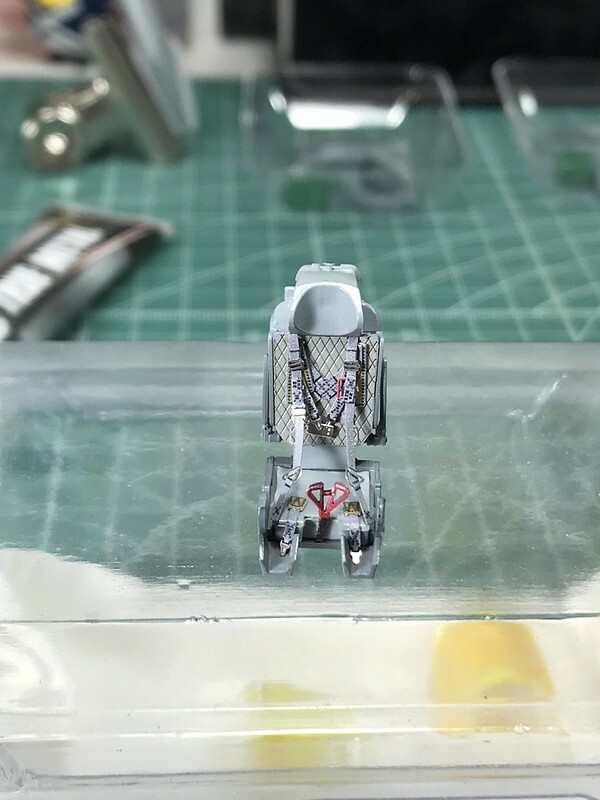 Cockpit tub and control panel have decal details. 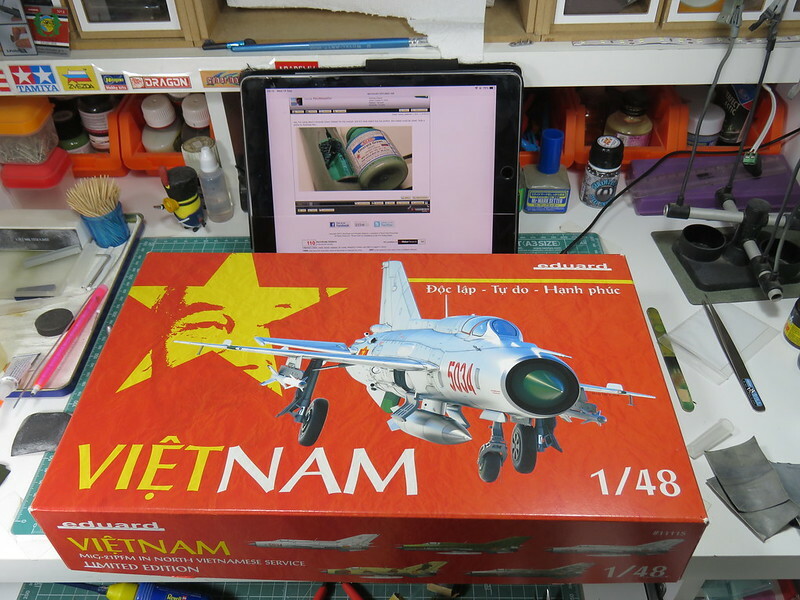 Fine for this scale, but unfortunately the decals aren't sized correctly. 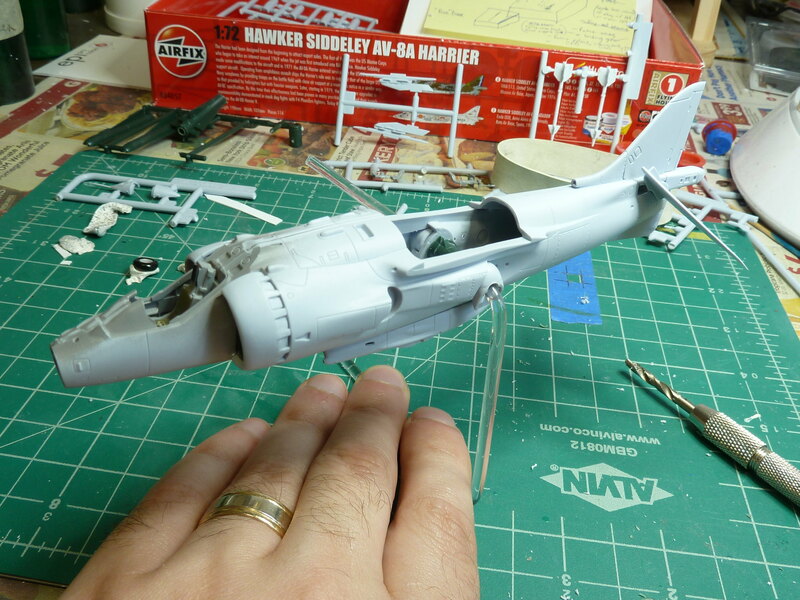 Fuselage halves clamp the engine and tub in place, though again the fit is a little off. Mostly pretty good, but it takes some extra fiddling to get it all together just right. 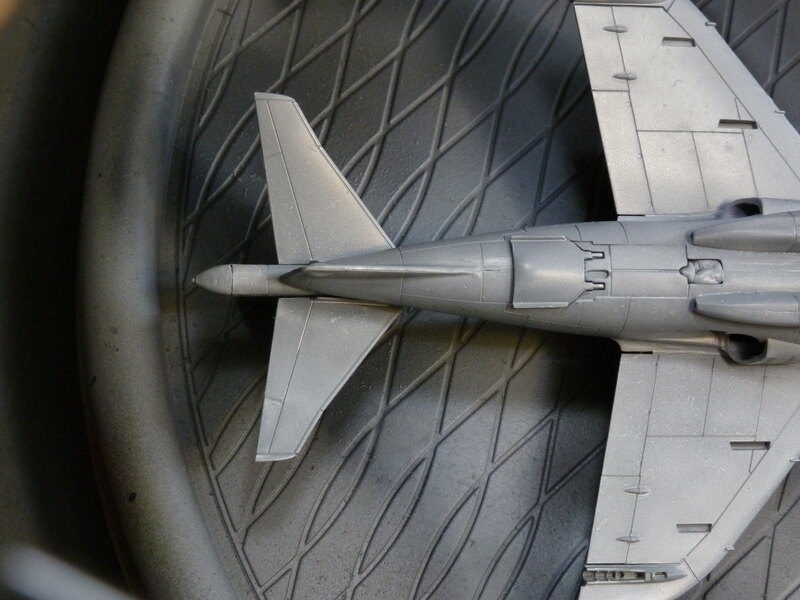 Control surfaces were molded as a single piece that got clamped into the tail section. 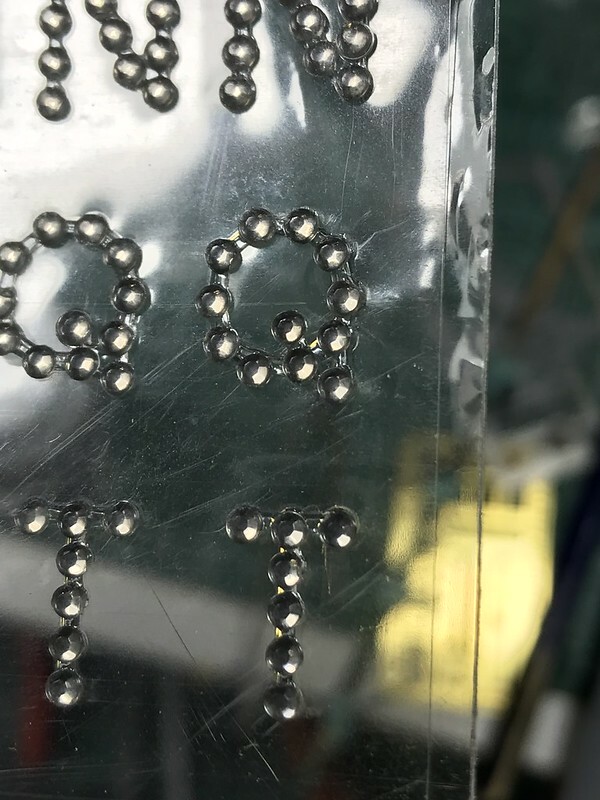 A little loose, but freely positionable. Nice compromise, I guess. 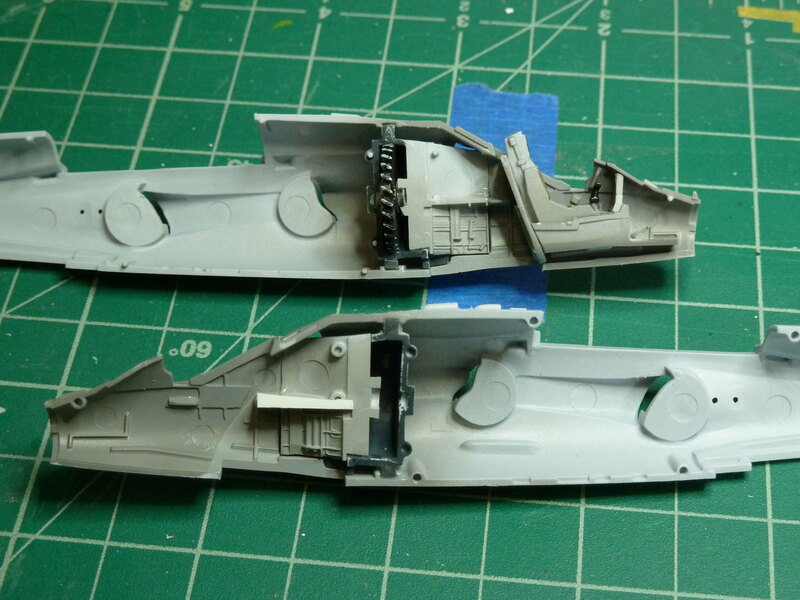 Engine cowilngs didn't sit flush with the fuselage without a fair deal of sanding. Some fine work so far! Really like those 3rd gen jets! 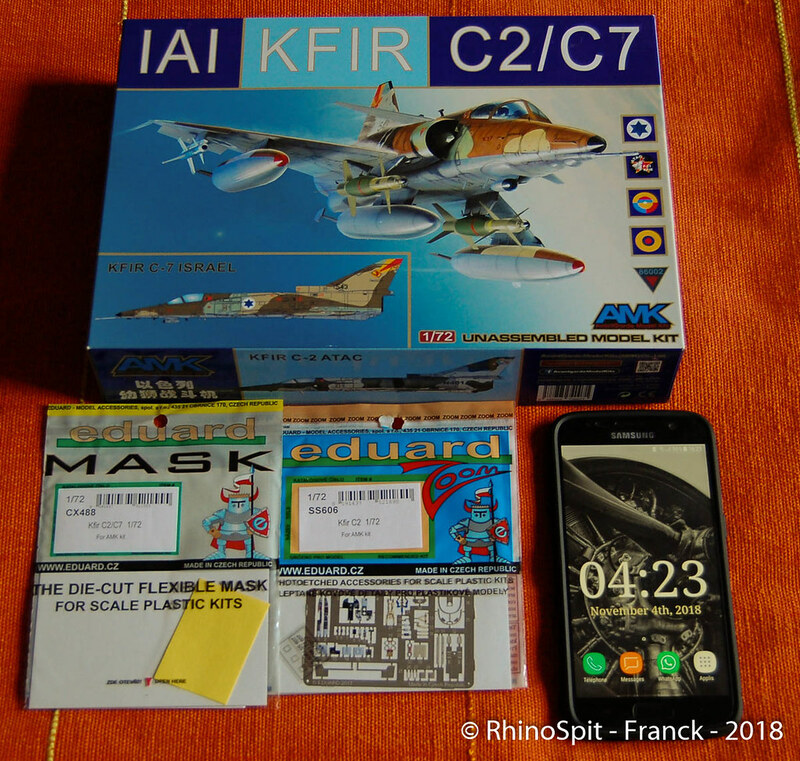 I have only two jets in my stash, one being an F-14, the other being a Phantom II. 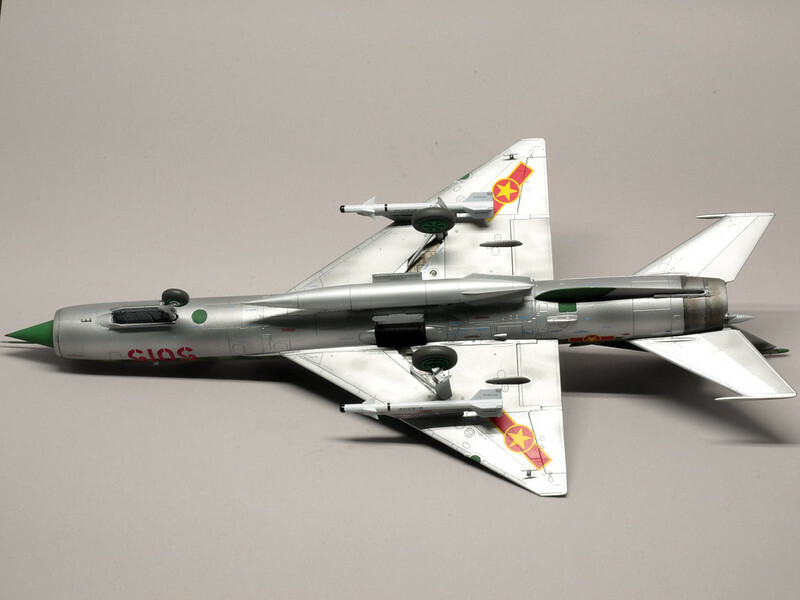 And as it seems you haven't got a Phantom yet, mind if I join you? So for now, the pit is ready and started with the major components. 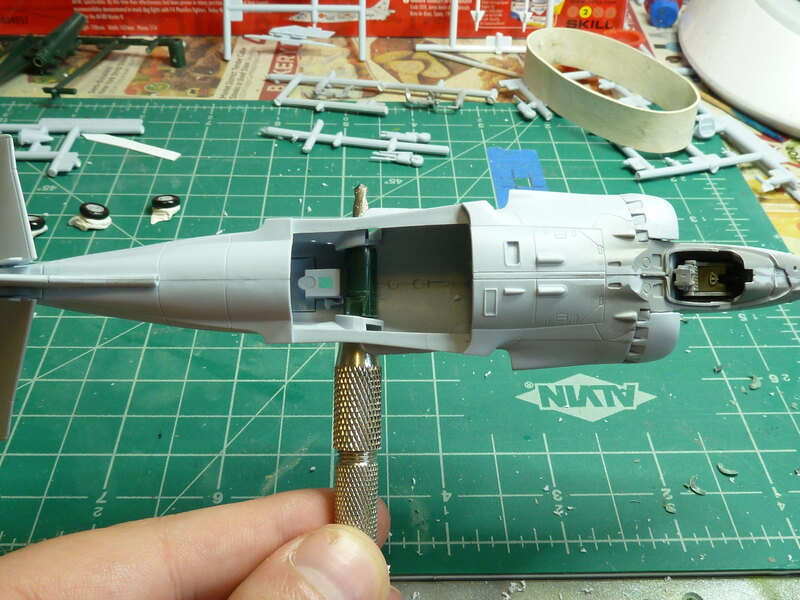 Took quite some effort to make this fit into the Hasegawa kit (it was meant for a Revell kit), bit I finally made it. Not bad so far, but some effort required. 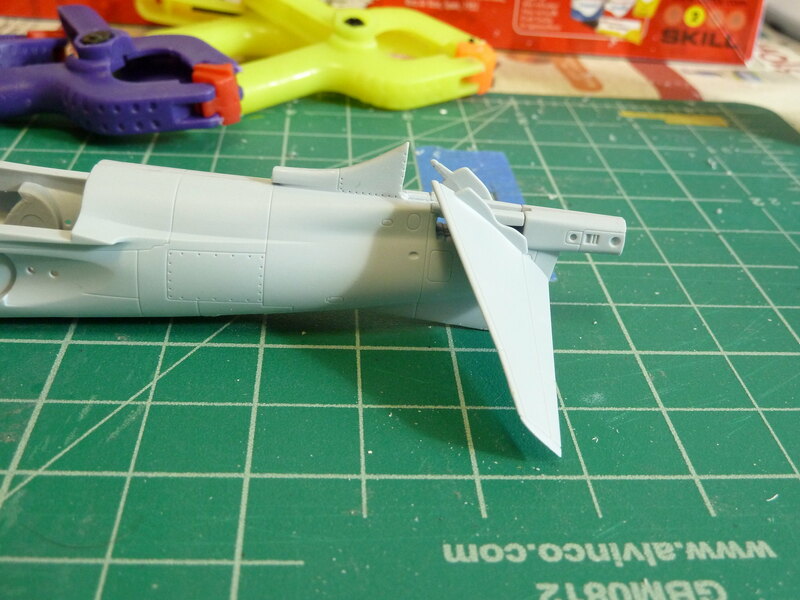 Fit of the intakes isn't stellar, especially underneath; and the instructions are lacking. They don't tell you to open the holes for the pylons nor to add that big keel panel towards the rear. But hey, we're modelers, right? 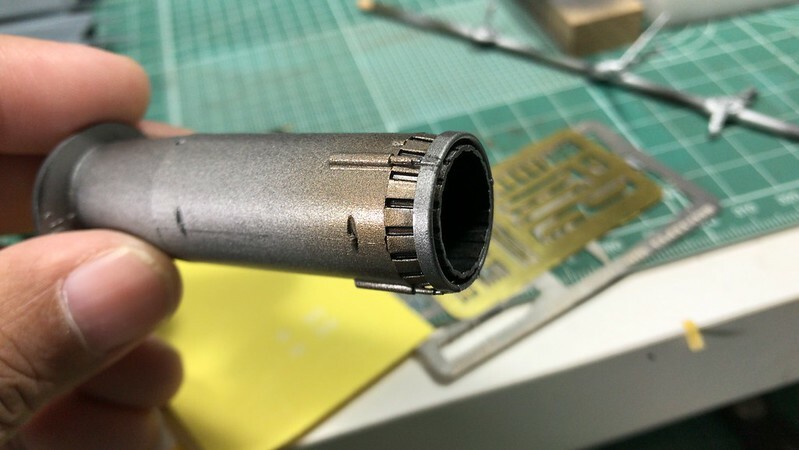 I think the tube right before exhaust nozzle is bit simplified: it should have lengthwise ribs and be divided into rings, and edge of the nozzle is too flat. 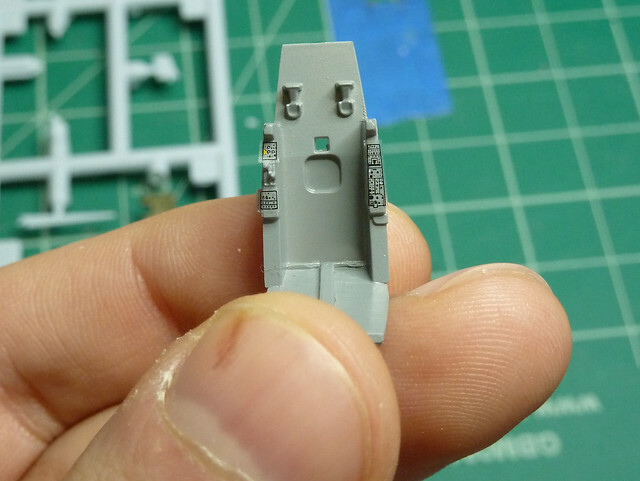 Eduard's Brassin set seems to get it right, but I'm building this almost OOB. I see a beatiful Delta!!!!! 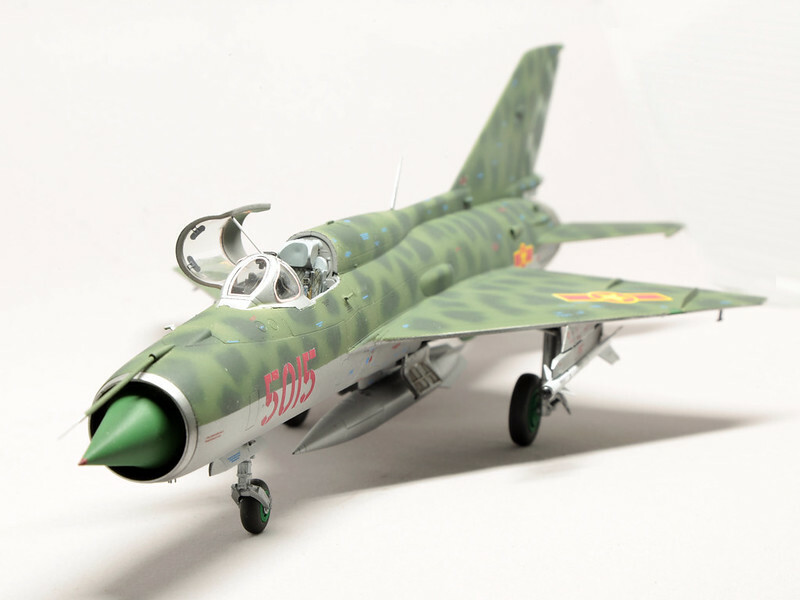 Pasi, I'm following your MiG-21 since I have the 1/72 MF from Eduard. 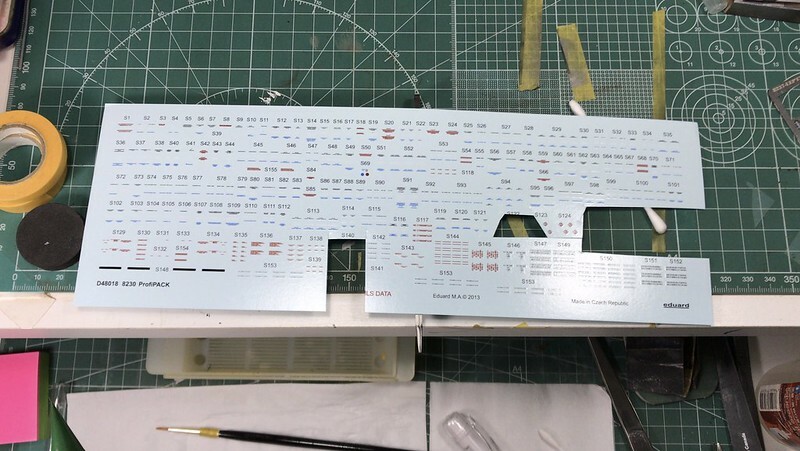 Did yours come with the pre-colored instrument panels? If so, how did you go about matching the interior color? The AM that I'll be using for the build. 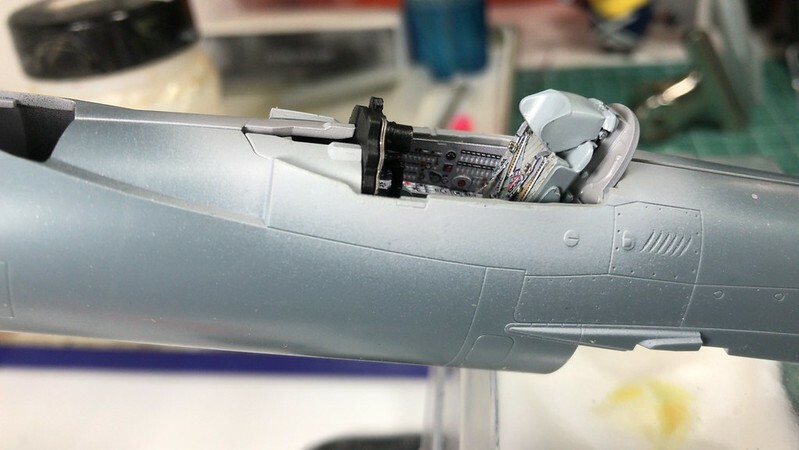 I started with the cockpit working in various sub assemblies. Unfortunately I was enjoying the build so much, I forgot to take enough pictures. ...and painted. 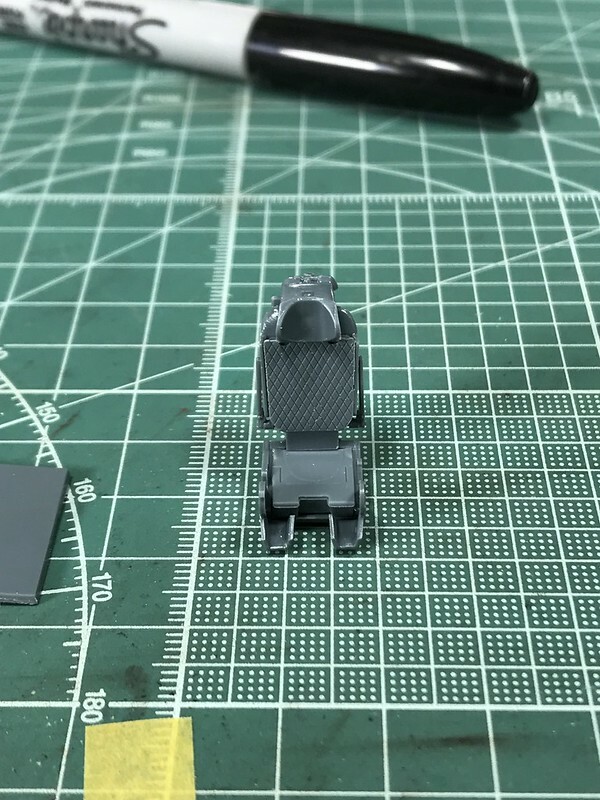 The pre-painted PE seatbelts made life so much easier. 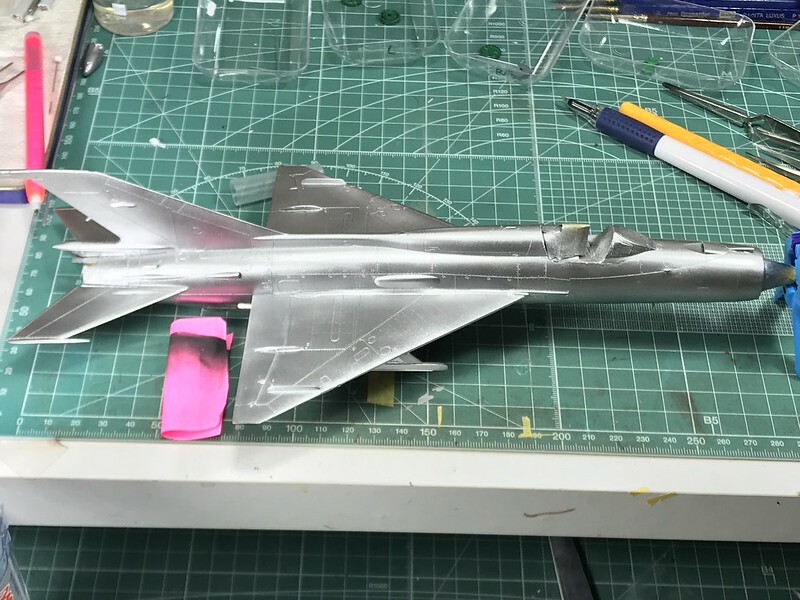 I painted the mach cone before closing up the fuselage. 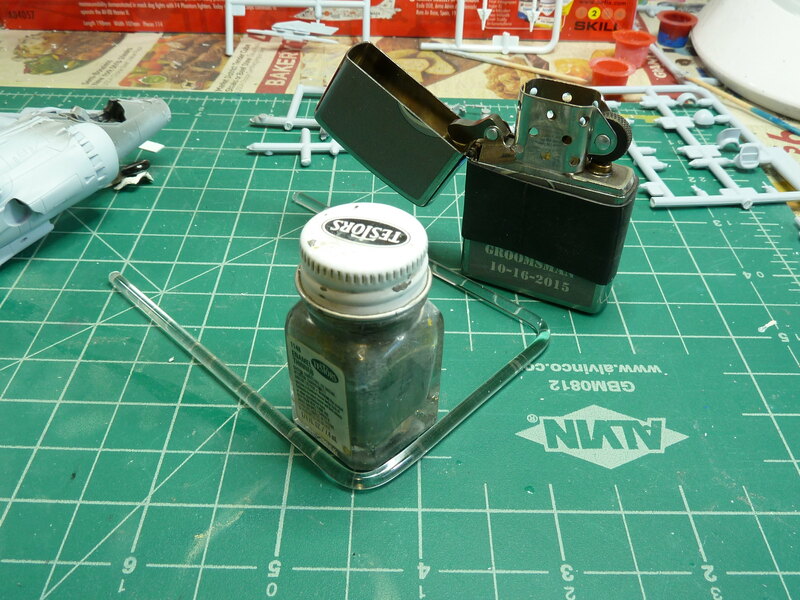 I wanted to improve the kit landing lights. ...and this was the final result. 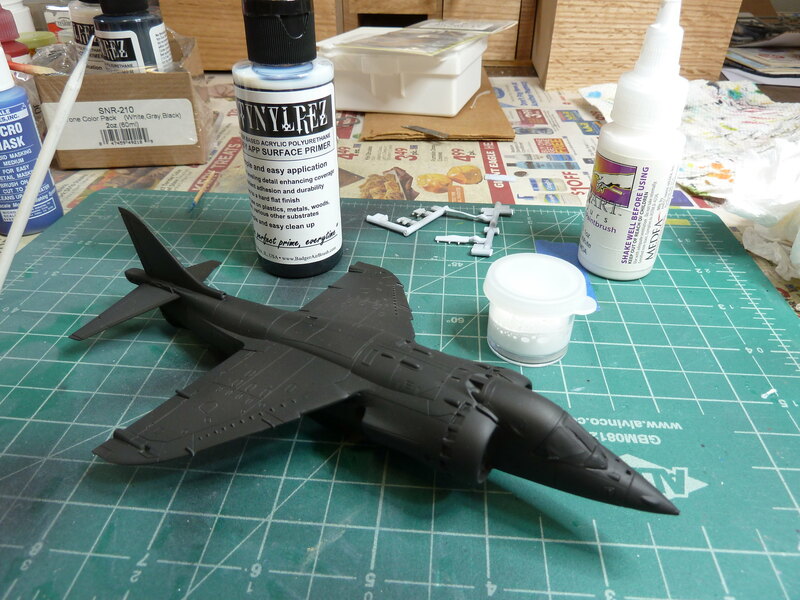 ...which were soon glued to the fuselage. 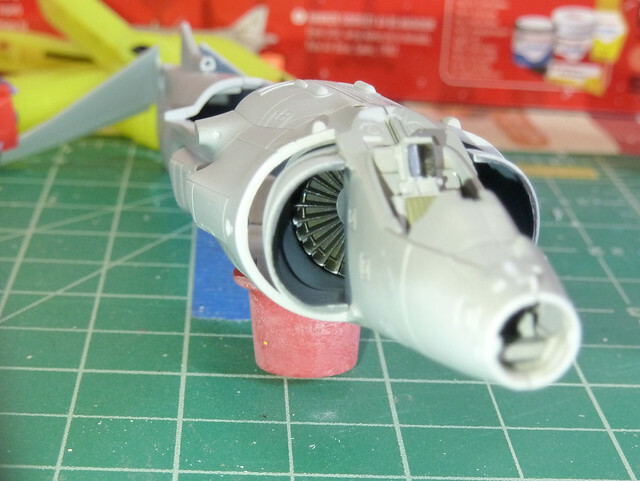 I also masked the canopy clear parts in preparation for the painting stage. 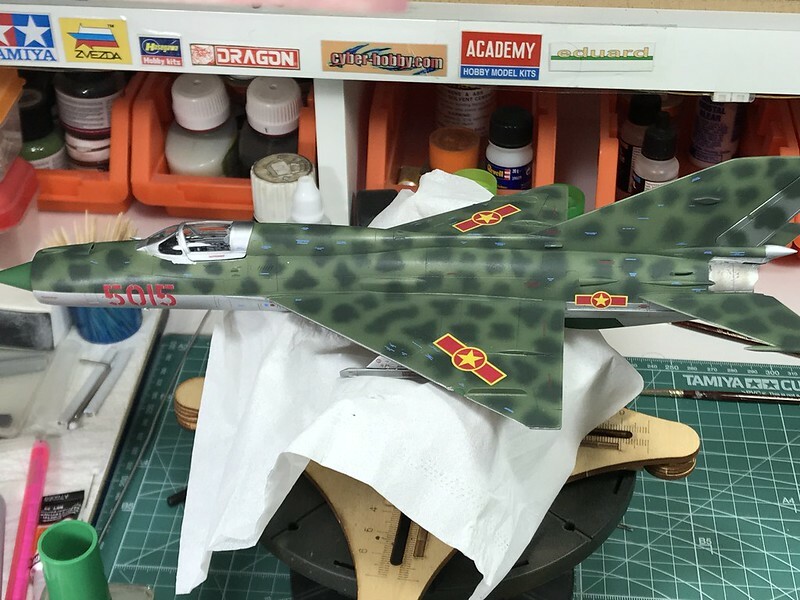 Next up is the decals. 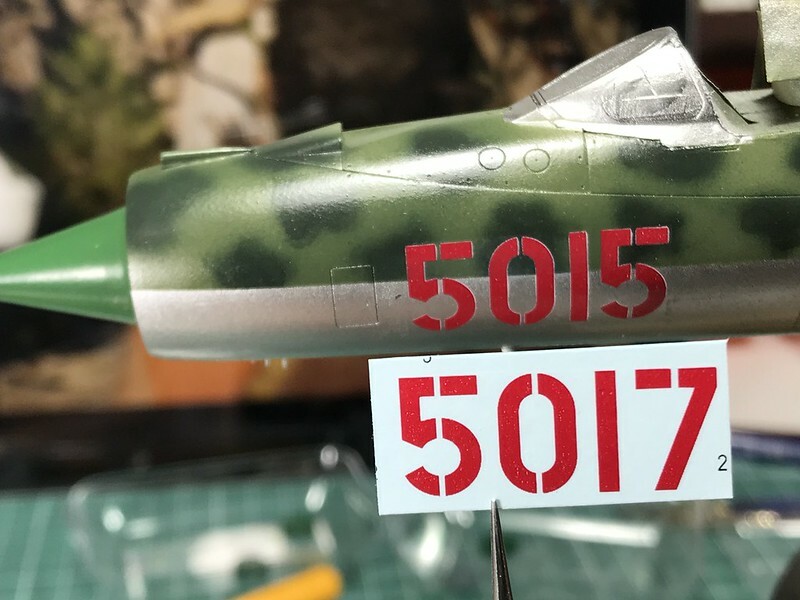 The kit comes with "5017" markings, but I wanted to make it "5015" as per the photo. 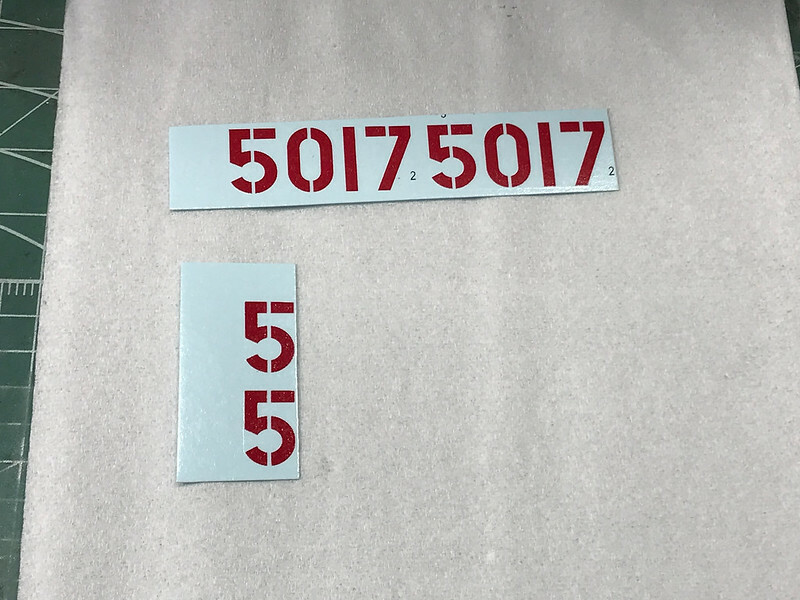 Thankfully the decal sheet has enough spares for "5". 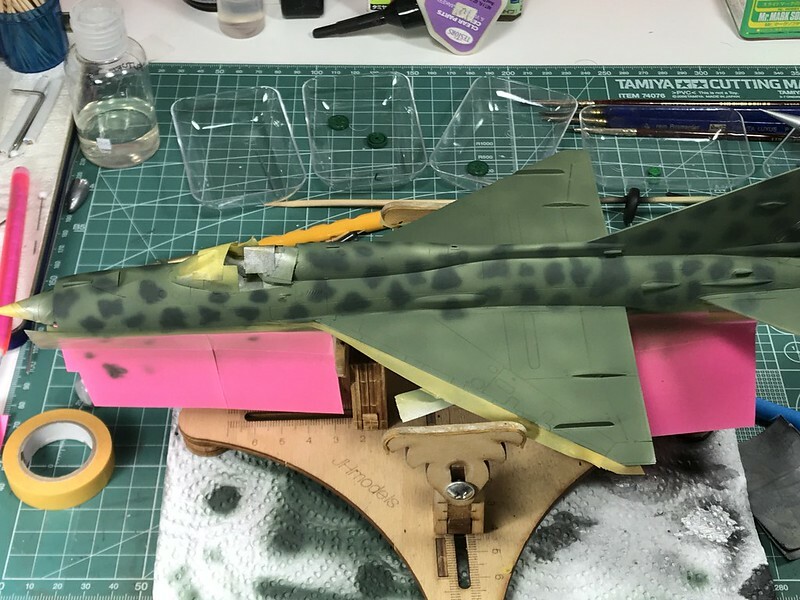 Looks like some minor surgery will be needed to make the markings. All that in the next update. Due to a change in the Carpet Monster's diet, it ate the DECALS!!??!!. 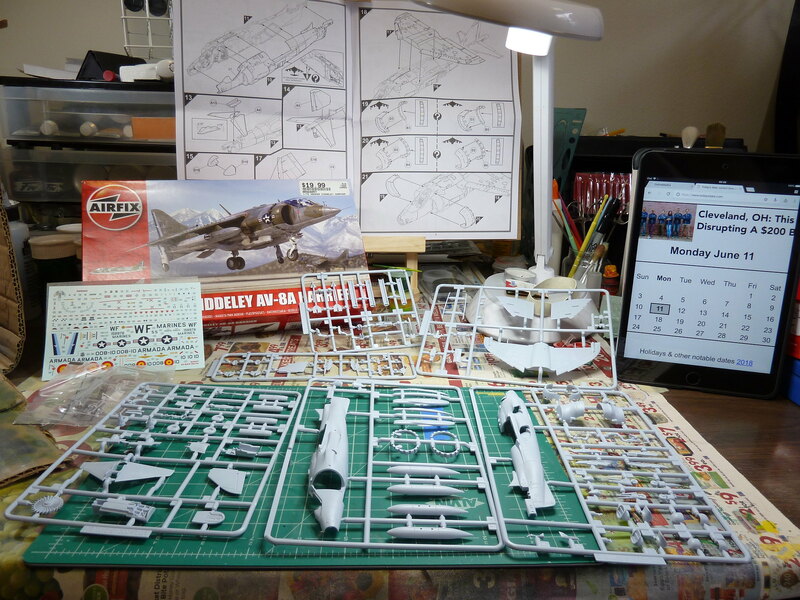 I'm changing my entry tot he Hasegawa 1/72 F-20 Tigershark. With a month and a half to go, it's going to be tight. 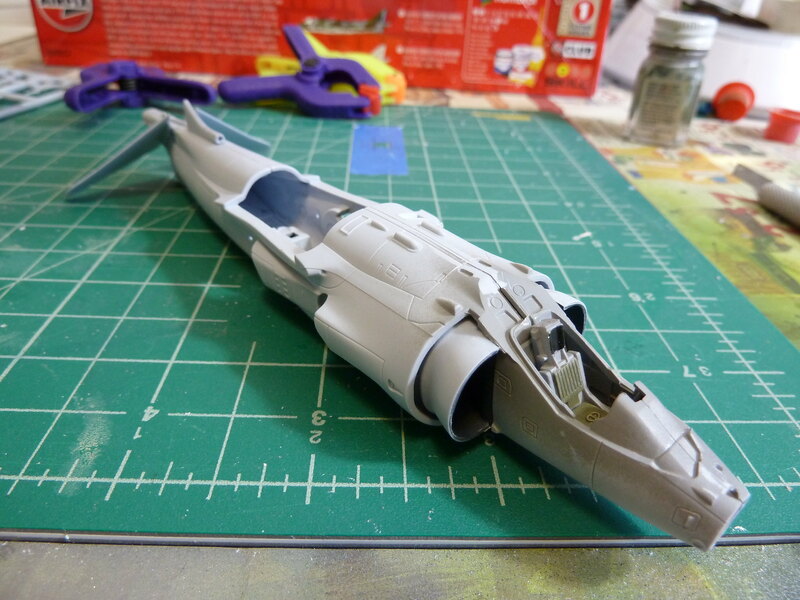 Fortunately a couple of detail parts are already painted, so that'll speed things up. With a month and a half to go, it's going to be tight. 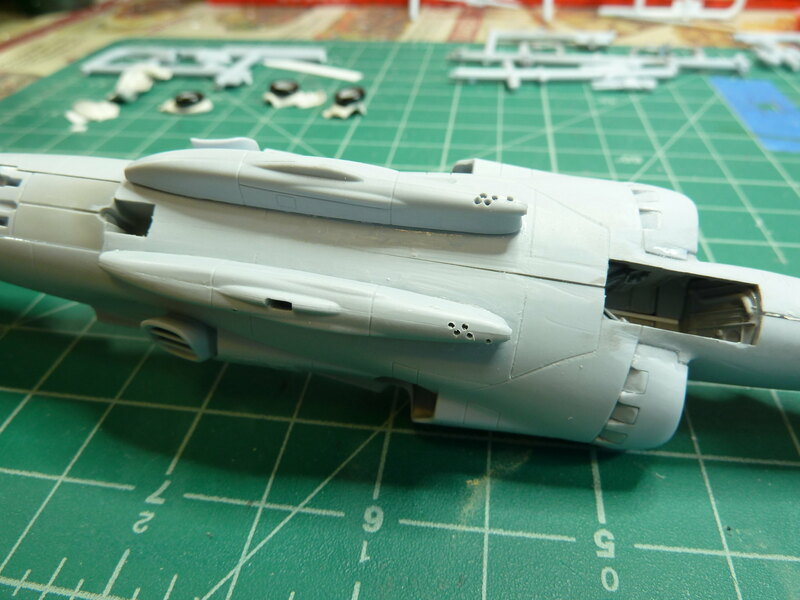 Fortunately a couple of detail parts are already painted, so that'll speed things up. You actually have until the end of December, Mark. You can do it! Looking good so far everyone! Wow, disaster almost struck twice on this one campaign. I've been staring at the instructions for a couple of days, disbelieving that I need to paint both the headrest and the padding on the bang seat gloss red. Internet picture search turned up almost nothing except one artist's cutaway with both pads red. Well, OK, I'm going with a green pad and a red headrest. But wait.... Where's the seat? 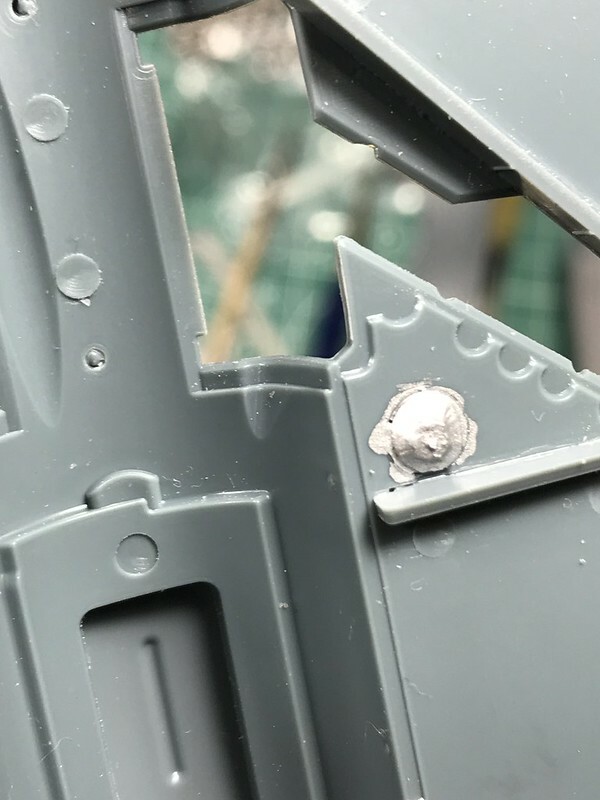 It's no longer on the sprue, nowhere in the box, ah crap another hanger queen on the same campaign? 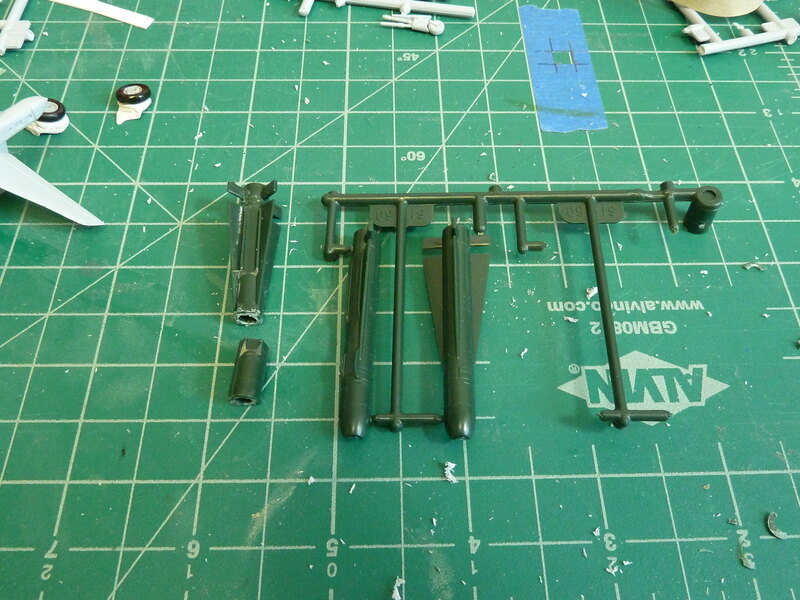 A mad scrounge among all of the stray bits of collected parts is turning up nothing. 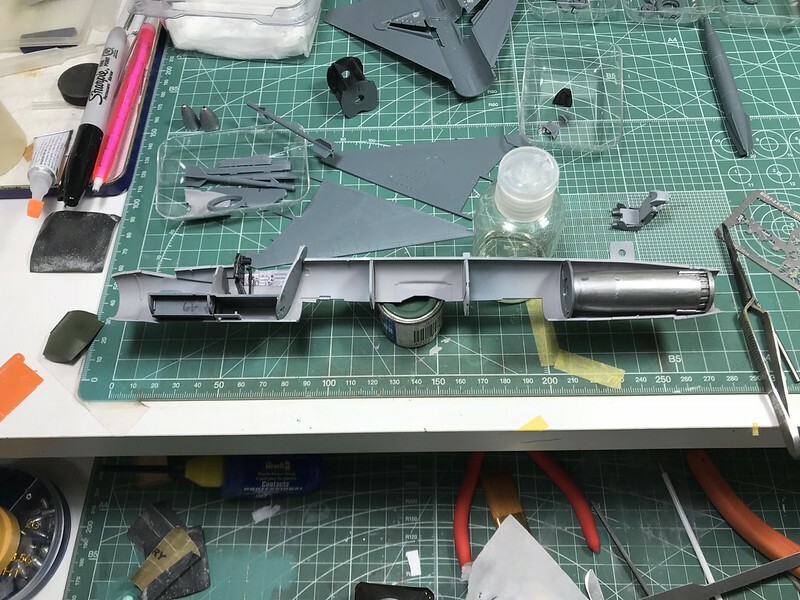 Finally in a canister of parts marked F-105G, there's a lone bang seat already painted with a green pad and a red headrest. 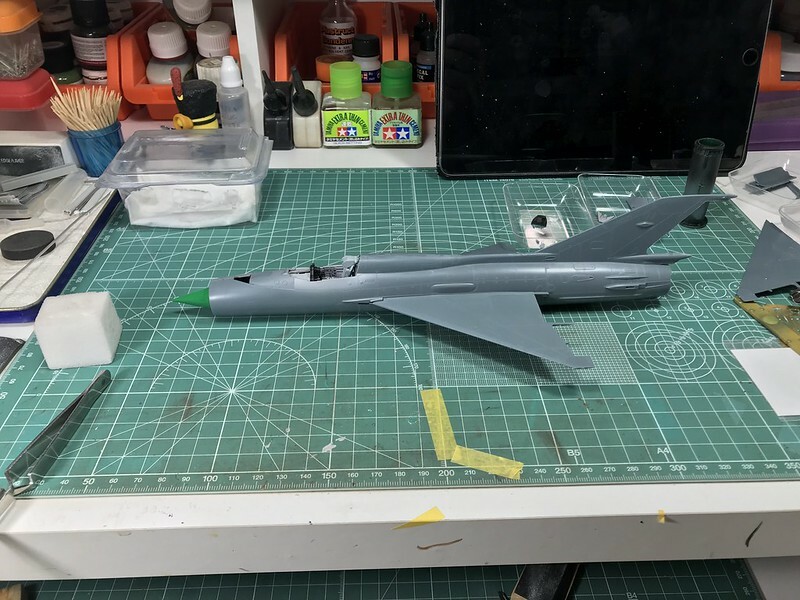 But wait, the Thud is already closed up waiting on the paint shop for an SEA camo. 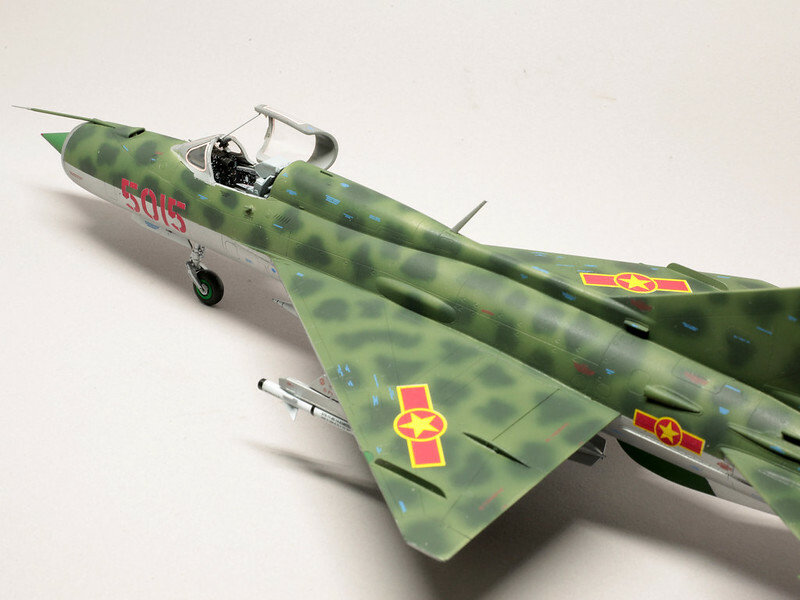 This can't be the seat for that plane, it must be the missing F-20 one. Hmm, I guess I already dealt with the color question. 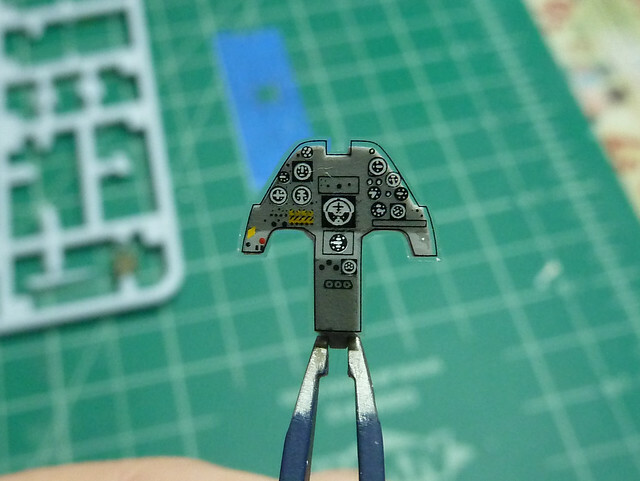 Oh well a couple of lost days and I just need to paint the one handed pilot to finish the cockpit. 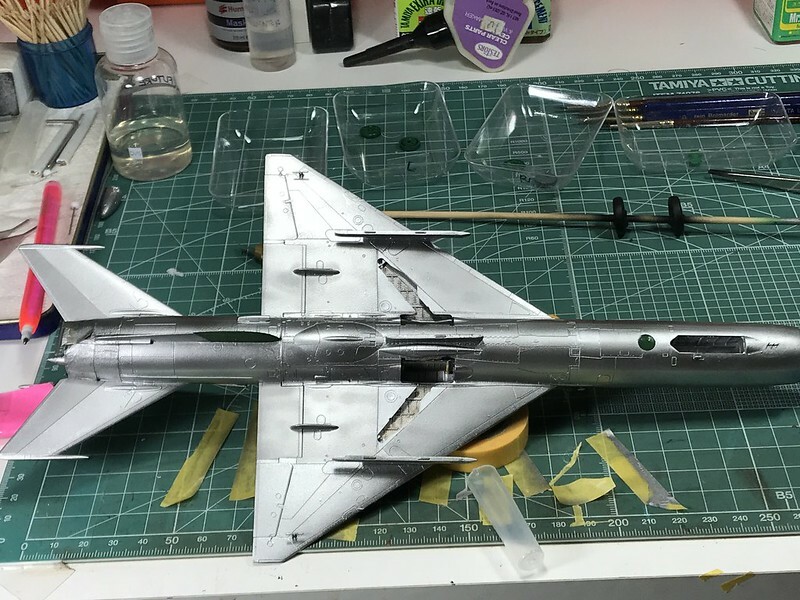 As usual, it's been a while since I've given an update, so this is gonna be a long one...kinda like Raj's update, but WAY less impressive than his build! This is my goal for the build. 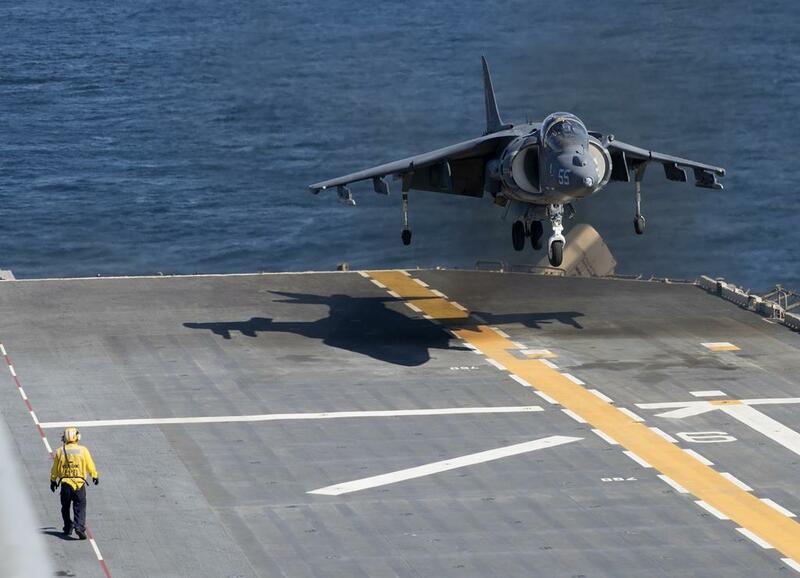 I'm aiming for a dio of the Harrier landing on an LHA/LHD. 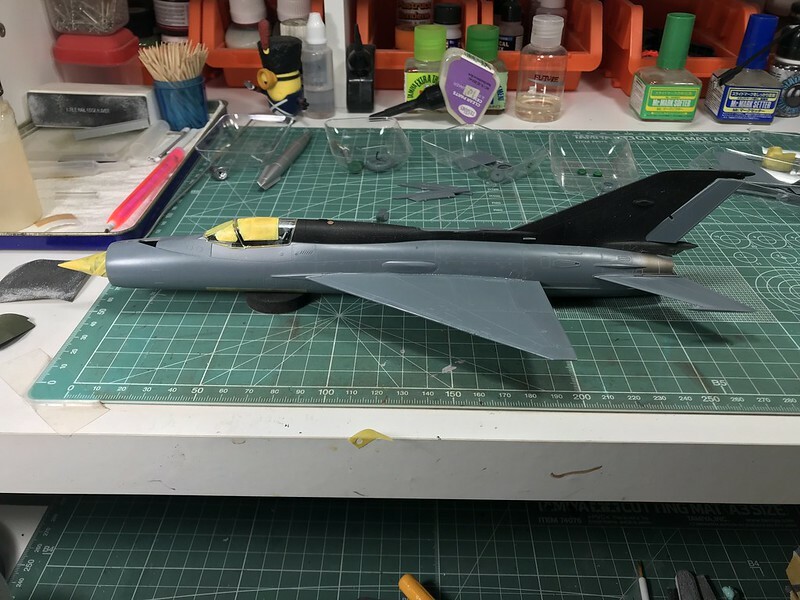 I'm planning out the deck now, the deck crew is complete, and I think I have a good strategy for suspending the Harrier mid-air. 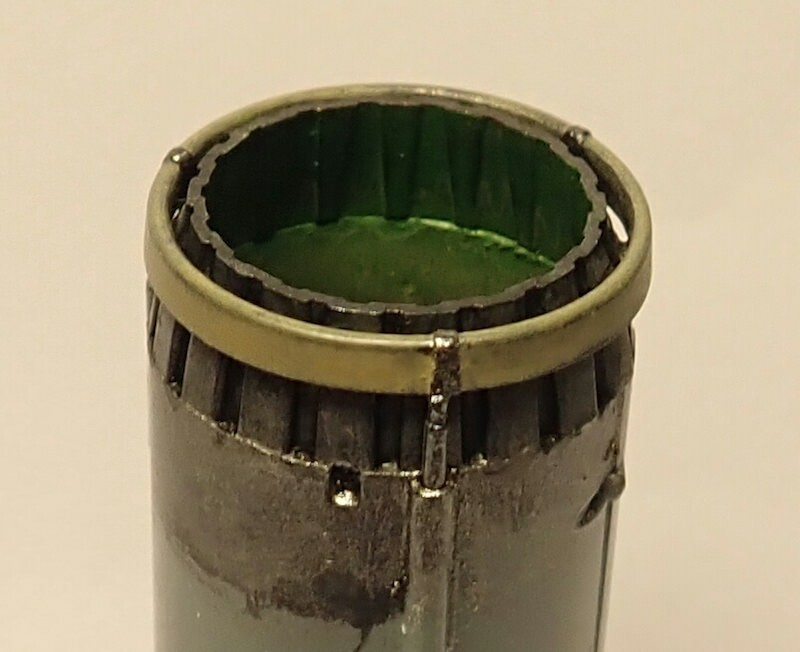 I took clear acrylic rod, softened it over a flame, then bent it around a Testors paint jar. 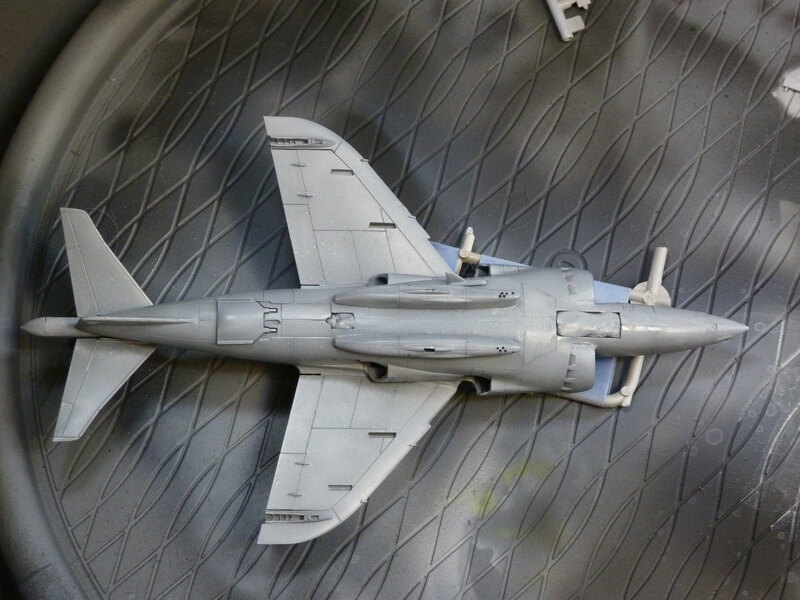 Given the Harrier's unique exhaust ports, there wasn't really a central option to install the rod. 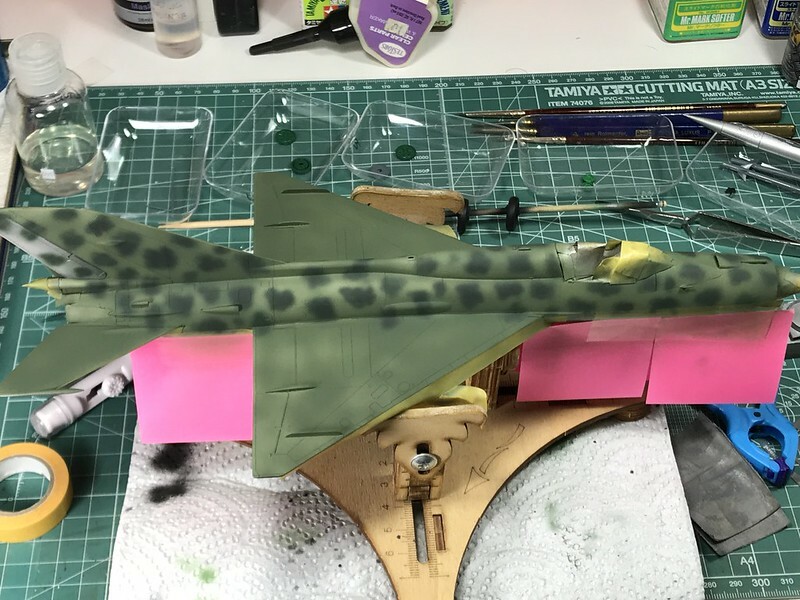 Instead I planned to stick the rod through the rear exhausts, which ideally will be concealed pretty well by the pylons and armament. 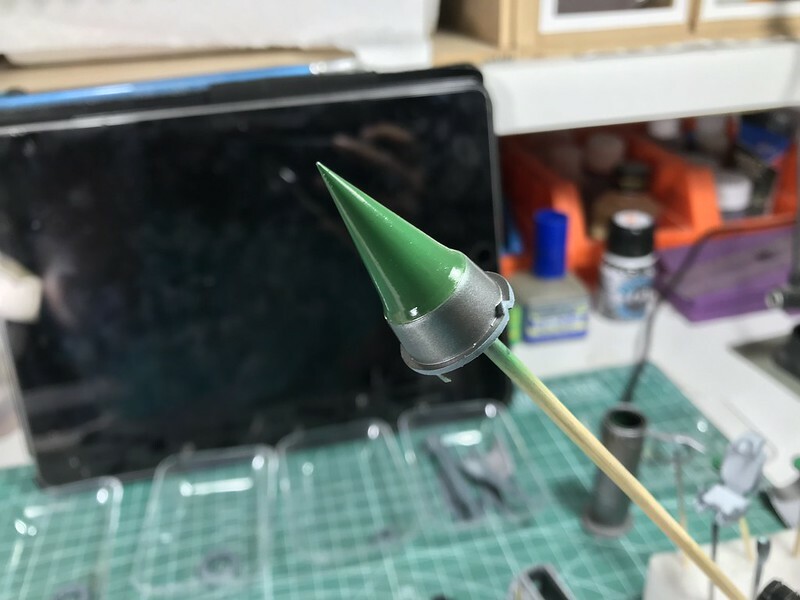 To add some structural support, I dug through the spares box for a thick missile which I trimmed to fit between the exhausts internally. I found some good reviews for this, "Canopy Survival Kit". 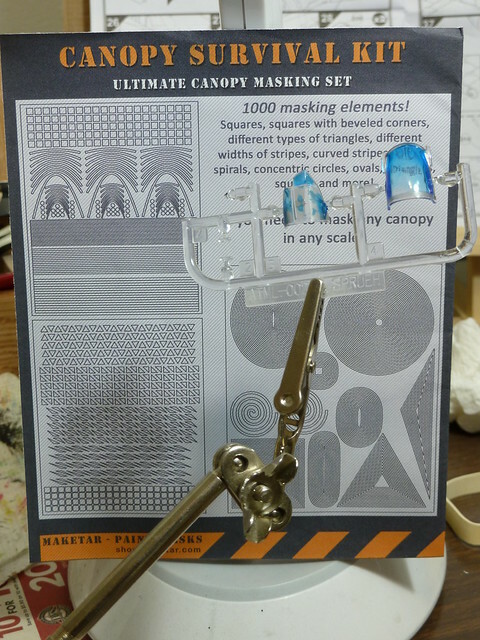 Basically it's like a free-form Eduard mask set...three sheets of precut shapes that you can modify to fit pretty much any canopy shape you come across. They come in that familiar yellow tape material as well as a clear vinyl. I got the latter for a better price, but I'm not sure it adheres as well as the yellow tape. I guess we'll see in a bit... At any rate, I masked with the Survival Kit and MicroMask. I also splurged on a good primer. Stynylrez...stupid name, great paint. 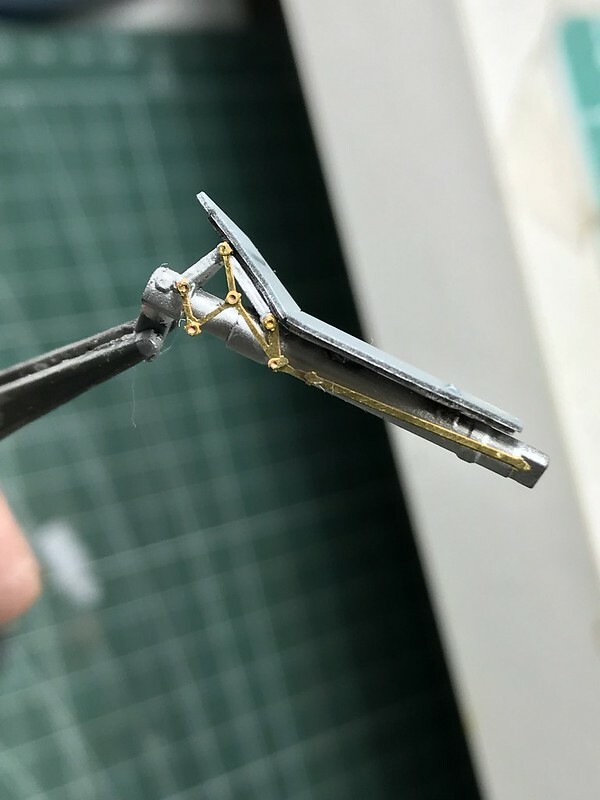 This time around I'm trying the black-basing technique. 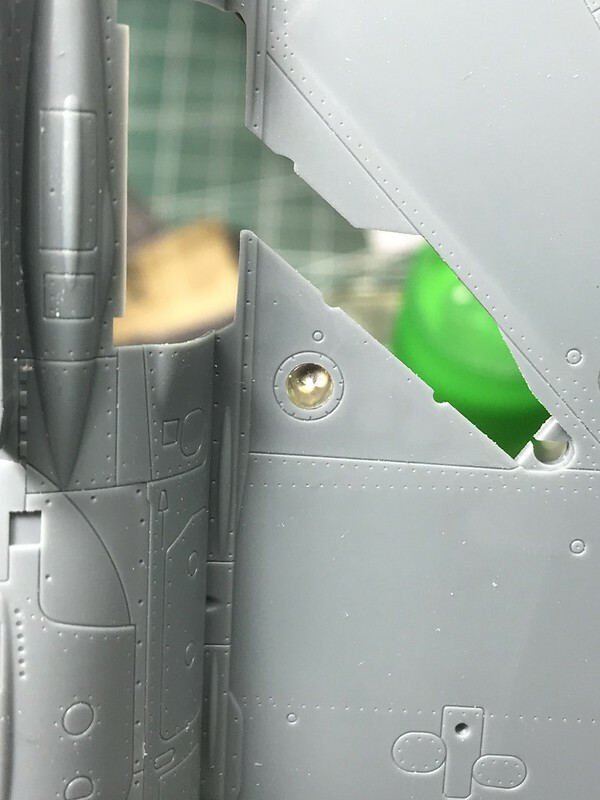 Basically, instead of priming light and darkening panel lines, you prime dark and lighten the panels between the lines. 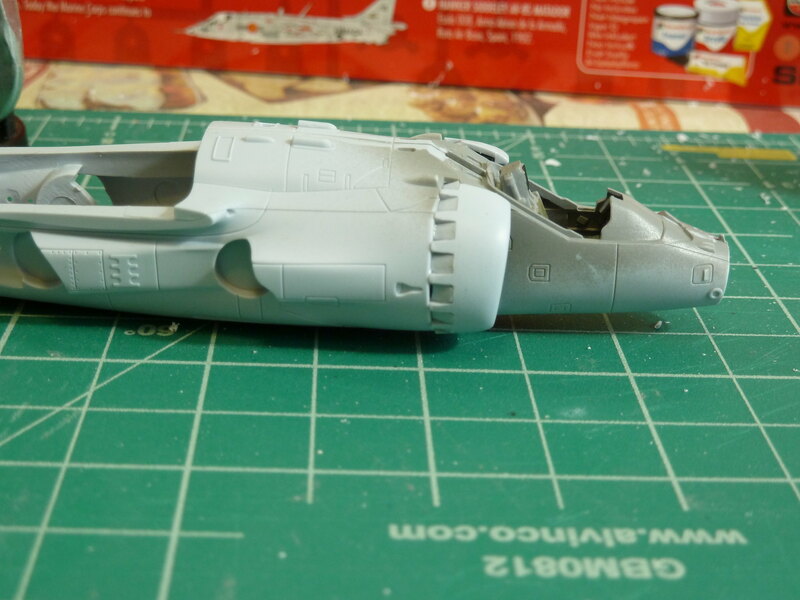 I think in 1/72 scale, it's easier to mottle solid panels rather than trace the panel lines. I didn't get the best picture, but I think it still gets the point across. 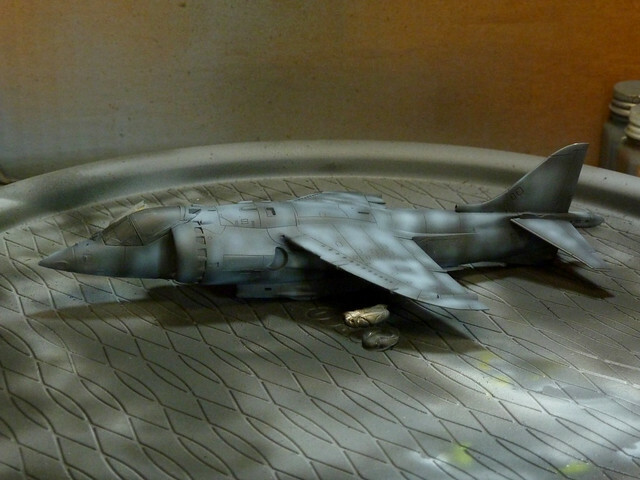 And finally we get to the problems...painting the underside. 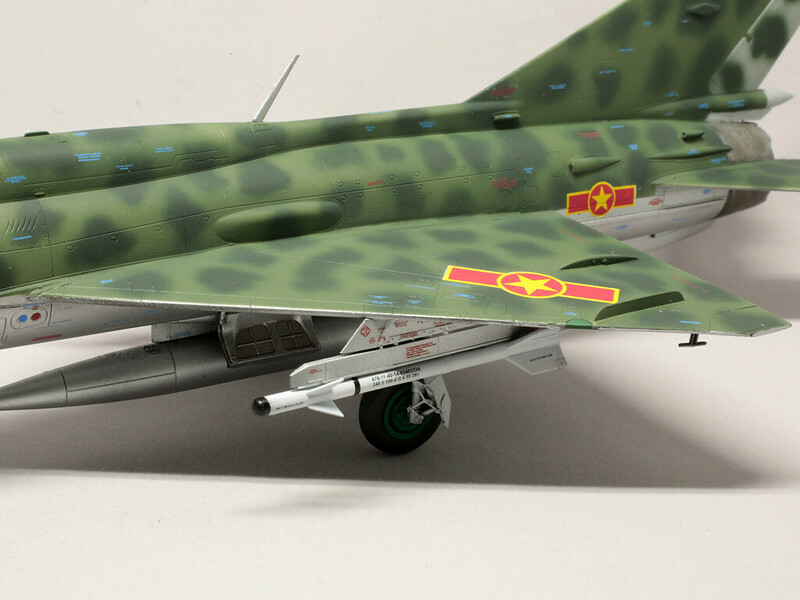 USMC Harriers in the '80s wore the RAF's camo pattern, which used an anti-flash white on the underside. 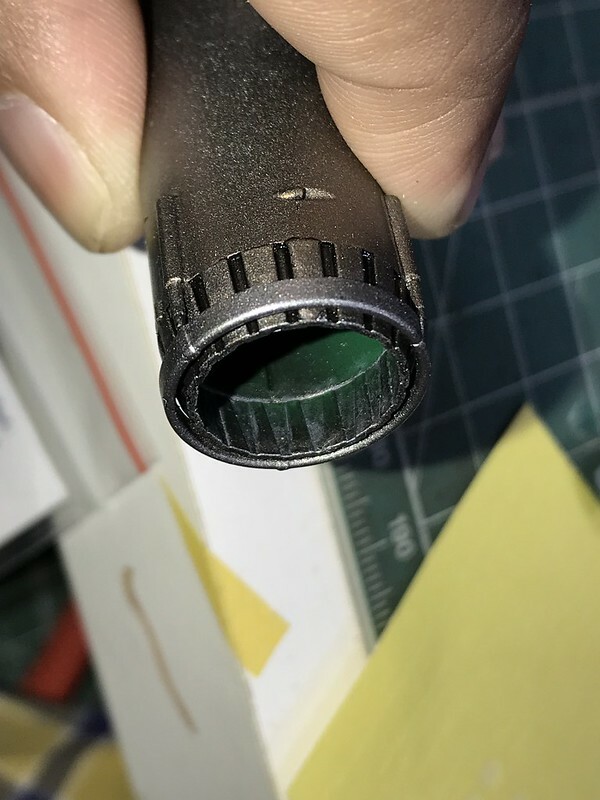 In order to maintain the preshading, I treated the paint almost as a blending/dusting: highly thinned, super-thin layers, stop painting just before you really think you should stop. However, the coverage isn't going down so smooth. I have four theories, take a look at the pictures (not the best quality, sorry) and see what you think. Some impressive work here guys! Pasi and Raj, your MiGs look great! After 6 week in China, time to start this campaign ! I got some bench time and decalled the monster. Thankyou for letting me be a part of the GB. 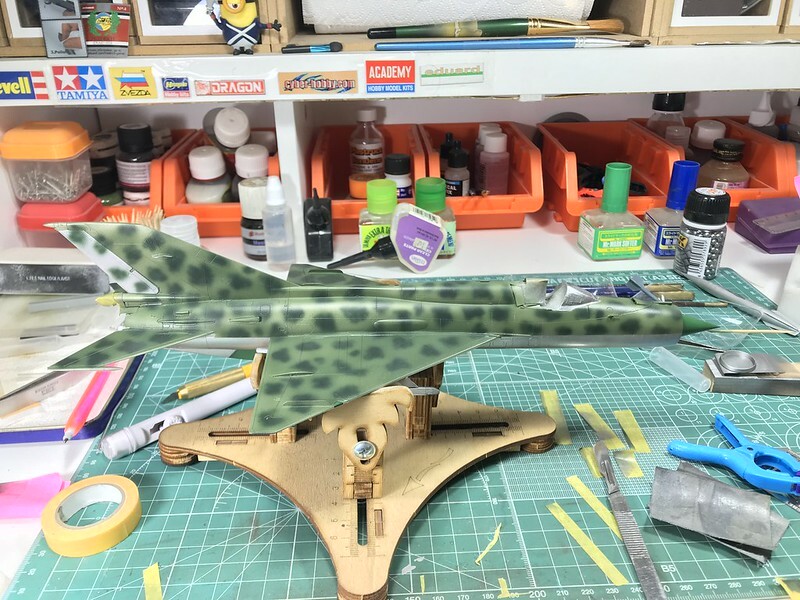 This was my first ever post WW2 aircraft and I enjoyed building it. I might even build a few more in the future. Nice work with the 21, Raj. I like how it turned out. Not sure if I'll attach extra tanks and missiles, both should be valid options. Been a great Campaign, thanks! 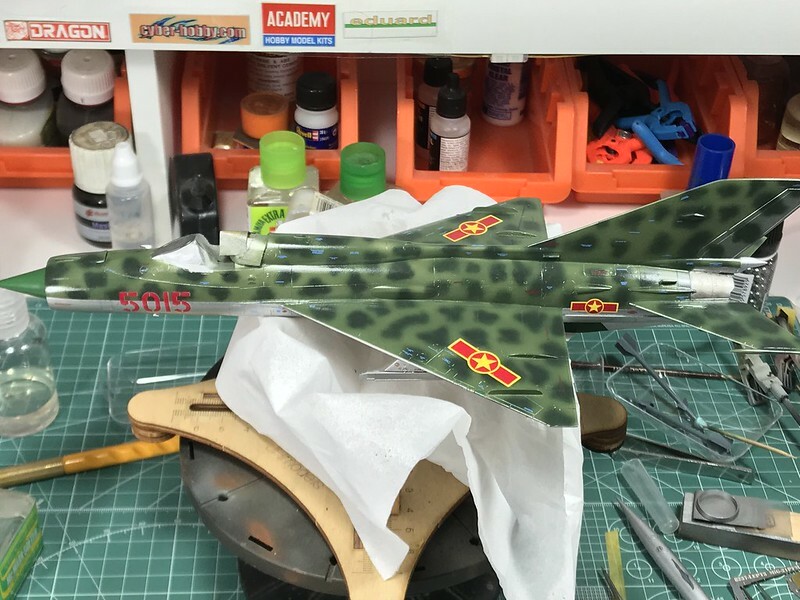 My initial go-round with paint on the 1/48 AMK Kfir C7. 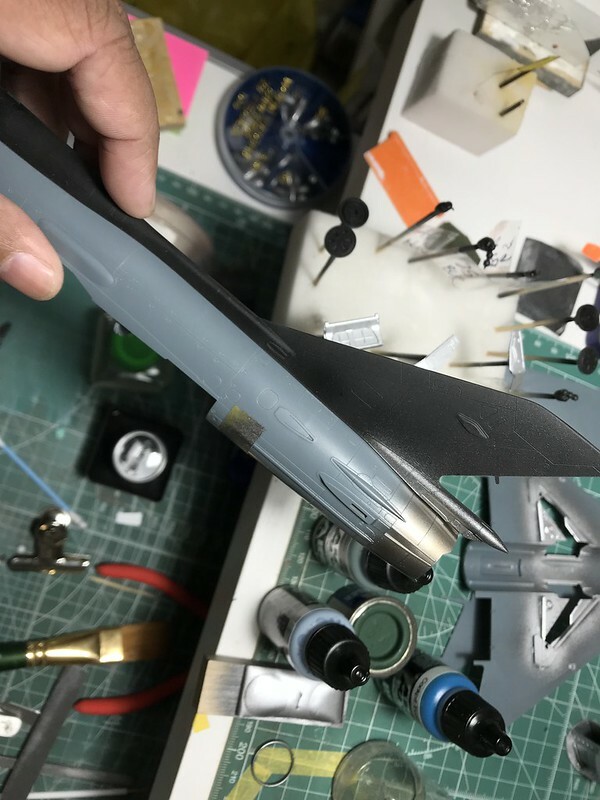 This is my first time using Vallejo for the whole paint job as I have their IAF set. Not too bad, though for some reason I had some trouble with the brown. User error, I'm guessing. Will need touch up with the sand and the light gray, but getting there! 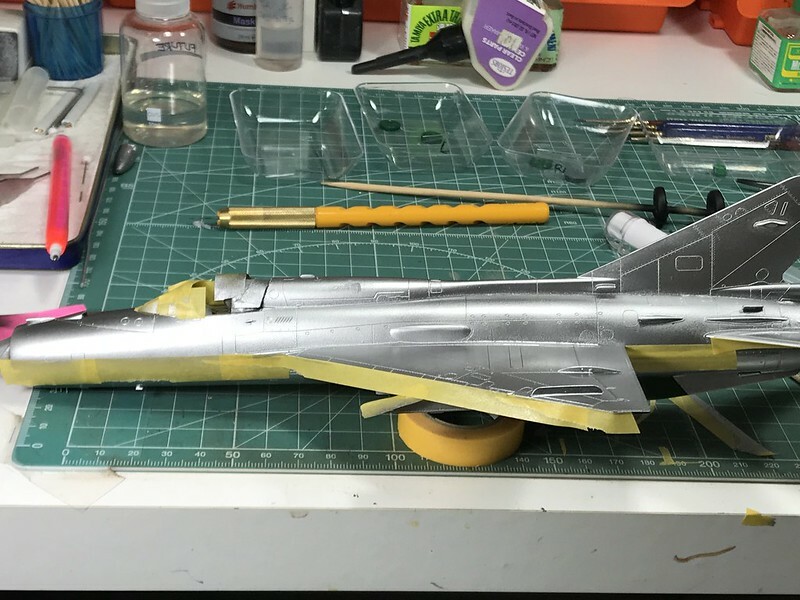 Have to touch up some areas, and there will be small NMF area around exhaust and black green fairings, but so far trouble free build.